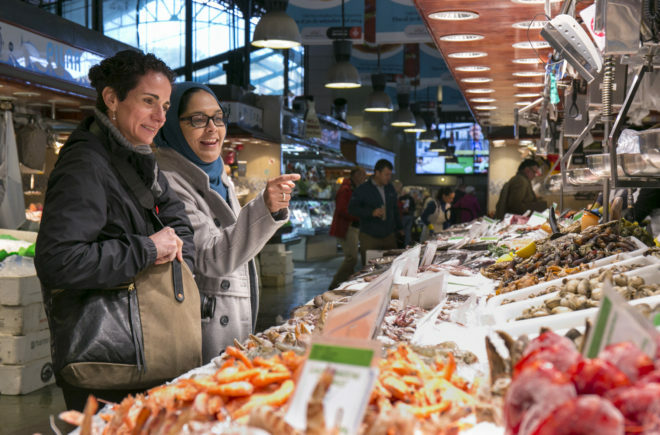 Participants of the 2015 International Public Markets Conference enjoy an interactive tour of Barcelona's exceptional markets. Project for Public Spaces is seeking Letters of Interest from those who wish to host and co-sponsor the 10th International Public Markets Conference in 2018. To be considered, please submit preliminary letters by February 17, 2017. For over 30 years, PPS has brought together community advocates, accomplished market managers and visionary leaders to explore the changing forces that are shaping the face of public markets. Beginning in 1987, we’ve hosted nine conferences (roughly every three years) in Seattle, New Orleans, Philadelphia, Vancouver, New York, Washington DC, San Francisco, Cleveland and Barcelona, Spain. The three-day conference program includes a keynote speech or plenary, workshops, networking receptions and market tours. Topics range from the role of public markets in the re-creation of local food systems to how markets can revitalize communities and public spaces. Our last conference, held in Barcelona in 2015, was a tremendous success, convening leading public market operators, developers and thought leaders from over 130 cities and 40 countries. What are the Benefits of Hosting the Conference? Hosting the 10th International Public Markets Conference gives the selected city/region the opportunity to share their area’s unique features and innovative development strategies with a wide and diverse audience. Hosting the conference will also expose national and international leaders in the market field to your region’s public markets and market-related activity—which might include urban gardens, community kitchens, business incubation efforts, etc. In addition, as a co-sponsor, your organization will be instrumental in helping PPS shape the greater agenda and workshop topics. With approximately 400 attendees, the Public Markets Conference will draw tourism dollars to your region, and international promotion efforts highlighting both the conference and the local host community will reach thousands of market sponsors, managers, and advocates. Letters of Interest for hosting and co-sponsoring the 10th International Public Markets Conference should not exceed three pages. Respondents should refer to the Selection Criteria to specify why their city/region is an ideal location for the next public markets conference, and why their organization would be a strong co-sponsor. For more details and submission guidelines, please see the full Request for Letters of Interest here, and be sure to submit your letters of electronically to Kelly Verel (kverel@pps.org), no later than February 17, 2017.